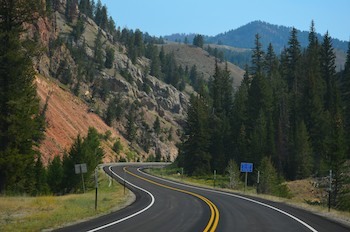 Late August, 2012 – Heading south out of Jackson, Wyoming, we followed the Centennial Scenic Byway (Route 191). This is a lovely curvy road that weaves between mountains and eventually emerges into wide open spaces where there is virtually nothing but undulating land as far as you can see in any direction. What a surprise it was, then, when we suddenly came upon a huge construction project that appeared to be the erection of a large bridge over the highway — one that could easily support several lanes of traffic — but with no roads leading to it on either side. We drove further and discovered a second similar bridge being built. Huh? Then more construction followed with workers busily paving a bike path along the edge of the highway. Cool! But what really knocked our socks off was the sudden appearance of two brand new 3-story hotels on either side of the road: upscale Hampton Suites and Baymont Inn and Suites. What in the world? Minutes ago we had been driving through vast empty plains. 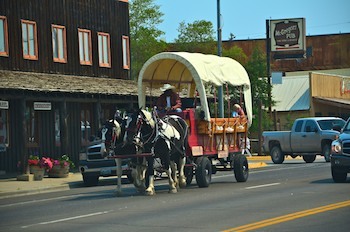 This was Pinedale, Wyoming, we learned, something of a modern version of Montana’s Virginia City and Nevada City gold mining towns, where drilling for natural gas was driving a boom like we’d never seen. Beautiful schools, lovely city parks, a chic brewpub, a horse-drawn carriage taking people through town — these were the fallout from massive multi-national corporations coming to town to set up shop and drill. 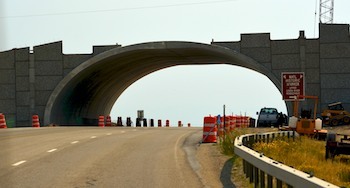 We learned that the two big bridges outside of town were for wildlife, not people or cars. 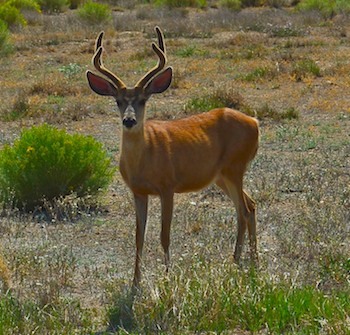 Large animal migrations cross the highway each spring and fall, and the new bridges would give the deer, elk and other migrating creatures a way to cross the road safely — and spare many cars from being totaled. A tunnel was being dug for these guys as well, since some animals like to take the high road while others prefer the low road… Wow! I hope the animals can read the road signs leading to their bridges and tunnel! 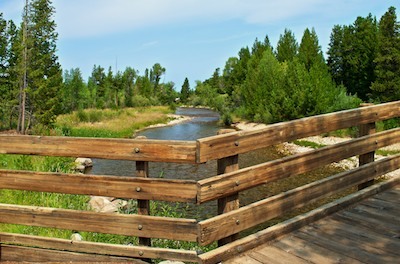 After a few days in town enjoying the fabulous library and strolling the pretty paved paths in the woods and along the streams in the city park, we ventured out of town towards Fremont Lake and the Wind River Mountain Range. 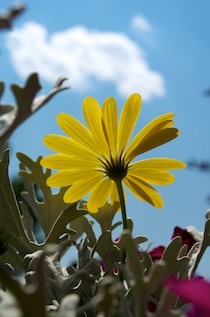 Unfortunately the smoke from fires further west was still quite thick and the views were hazy at best. So we drove down to the lake’s marina where we found sailboats and motorboats and elegant outdoor dining on a deck overlooking the water. 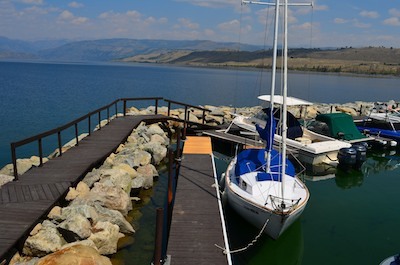 A sailboat left the dock and sailed towards the middle of the lake on a beam reach under a light breeze. Watching the wind fill the sails caught us between two worlds for a moment, as we hadn’t thought about our boat or sailing or the water for a very long time. 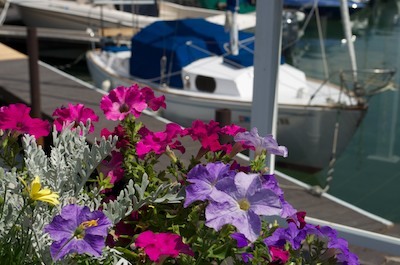 A sailboat reminds us of our other life! Returning to Pinedale, I indulged in another passion I hadn’t thought about for a long time, and rented a pair of skates for an hour. 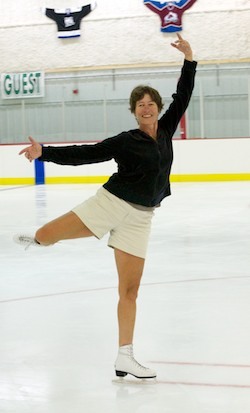 I buzzed around the town’s skating rink, very wobbly at first but gaining enough confidence to show off for Mark a bit, since he had never seen me skate before, something I had done intensively as a child. The wonderful town ice skating rink, the new skateboarding park, the excellent high school track, the well appointed city park and all the other public amenities were all top notch in every way, easily suitable for a city of 20,000. But Pinedale is said to have just 1,200 to 2,000 residents (depending on which brochure you read), and the number undoubtedly changes monthly as the profits in the gas fields wax and wane. 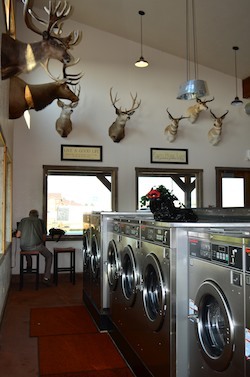 The laundromat is decorated with trophy heads. A fellow who was removing some heavy clothes from a laundromat washing machine labeled “Oil Field Clothes Only” told us the town had been in a slump in recent years as gas prices had fallen, but that gas prices were on the way up again and the companies would likely resume full-scale operations. Stopping in the BLM office to ask about camping options, our conversation wandered away from camping and the clerks opened our eyes to another side of living in a boom town: prices were higher here for everything from real estate to food to gas at the pump, and one woman just shook her head as she said worriedly, “Who’s going to foot the bill for maintaining all this when the gas companies leave town?” Gold mining and gas drilling, boom towns and ghost towns — as we looked around it seemed to us that life in the 1860’s and 2010’s had quite a bit in common. 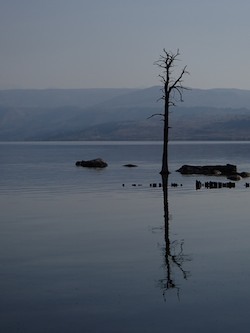 Exploring the back side of Pinedale, we discovered a pretty, peaceful lake. Watching the ducks leaving their triangular wake in the otherwise glassy water, as they have done for millennia, we found it hard to believe that both of the 3-story hotels we had seen on the way into town had been booked for two years before they were even completed. Such intense activity in such a placid place. We loved every minute we spent in Pinedale, but our time there drew to a close. We left in high spirits, singing away as we drove at 55 mph on the brand new asphalt of one of the smoothest, flattest roads we had been on all summer. Suddenly, a loud flapping noise right behind the truck jerked us to our senses. Instantly, Mark pulled over. 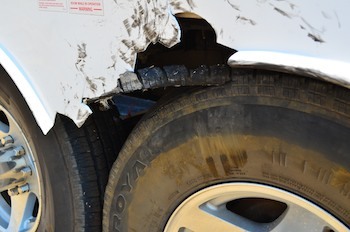 We jumped out of the truck and saw that the tire tread had spontaneously peeled right off of one of the trailer tires. Parts of the tread were wrapped around the axle, bits were strewn in the road, and a long strip of it was still partially attached to the tire along one edge. 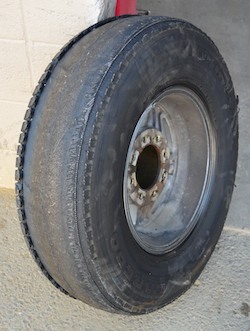 The tire was still at full pressure and the tread was plenty deep, but the trailer fender had been damaged badly when the tire failed. Good grief!! Mark whipped out his tire changing gear and got the spare installed in minutes. But we spent a long five days in Rock Springs, Wyoming, first getting all the trailer tires replaced and then trying to sort out the warranty situation with Michelin/Uniroyal. 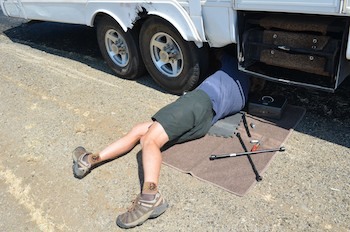 Mark pulls the shredded tread off the axle. Michelin/Uniroyal had just recalled 849,000 similar tires a few weeks earlier, because they had a tendency to have their tread peel off unexpectedly (hmmm!!). But ours was a slightly different model number. So, rather than an easy recall process we had a very difficult warranty process that started with us paying to ship the failed tire to Uniroyal via UPS (not cheap!). The denuded tire – all the tread had peeled off! 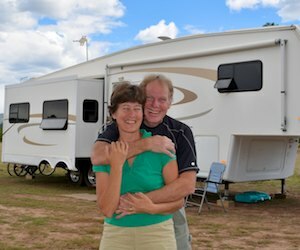 Their process is entirely based on the US mail service, rather than fax and email (which they don’t consider legally viable), and it involves getting documents notarized and mailing off written quotes from RV repair facilities. None of this is easy to do while traveling in remote places. But we did what we could while in Rock Springs, Wyoming, and carried on. After many hours on the phone, Michelin/Uniroyal promised to reimburse the cost of shipping the tire to them and they agreed to allow us more than the usual 45 days to complete the warranty claim process. Phew!! Wyoming and Utah’s Flaming Gorge was looking really good by now, and we hustled down the road to get there as quickly as we could!!! 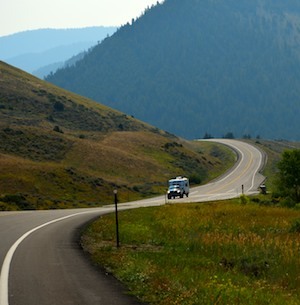 This entry was posted in Wyoming and tagged Travel, USA, WP Travel, Wyoming by Roads Less Traveled. Bookmark the permalink.